Saturday was one of those days. Actually, it’s been a pretty trying week or so for your friendly neighborhood Fulbrighter. I started to realize I was getting sick in the middle of my seminar last Tuesday afternoon. First it was my throat. Then there were the sneezing fits, the aches, and the coughing. Did I mention the chills and fever? Yes, there was that, too. By the time I saw Jane off at the airport on Thursday morning, I had such a bad case of laryngitis I couldn’t even say a proper good-bye. That afternoon, I had to cancel my seminar. I got the impression that the students, all three of them, tough Finns that they are, would survive the devastating news. The next morning I felt a little better, which I thought was powerful evidence in support of the Humidifier from Hell Hypothesis. I got up at 6:30, made myself some fried eggs and toast, wolfed them down at the kitchen counter in 20 seconds flat, bundled up and headed off—in pitch darkness, mind you—for the bus stop. On my bike. That’s right. I hadn’t been riding my bike while Jane was here, but this morning, I asked myself the musical question, What Would Jussi Do? And I decided that yes, Jussi would ride his bike to the bus stop, never mind that it was minus 15 degrees Celsius (that’s plus 5 in American degrees) with 10 centimeters (maybe six inches) of snow on the ground. I was right. En route, a half-dozen cyclists, scrupulously ignoring my wobbling and wheezing, passed me like I was standing still. Snow-biking, by the way, proved to be far less treacherous than I’d imagined. It was really quite uneventful. I didn’t skid once. The worst part is the wind on your face, which I cleverly minimized by keeping my speed down. Hahaha. Anyway, I got to the bus stop in short order. 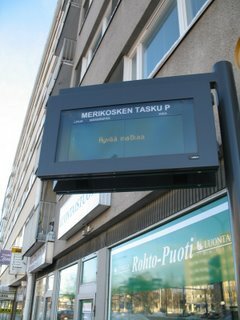 There, I checked the clock and the electronic message board that is supposed to track the incoming buses. Unfortunately, the message board had unhelpfully read Hyvää Matkaa (Have a good trip) for all of the previous week. So I just hunkered down. Remembering that fewer buses run on Saturdays, I double-checked the schedule that I carry in my back-pack. Sure enough, even if I had just missed the #4 bus due at my stop (Merikoskenkatu) at 7:55, there should be a #6 bus at 8:25. Not the end of the world. Even then, however, I noticed something unusual, and that was that I was all alone. Merikoskenkatu ordinarily is a pretty lively place, and 8:00 in the morning is not early by Finnish standards. I mean, the sun was practically up. So there I was, starting to feel a little forlorn, when, as luck would have it, I was approached by a young Finnish man, drunk as a skunk. Let me hasten to say that this was not particularly alarming. Drunks in Finland are nowhere near as belligerent as red-blooded American drunks. Still, this fellow was not one of those young men who walk through town cradling a 10-pack of Karjala that has just been breached. This was a guy who had been partying all night, whose Karjala 10-pack was ancient history, and who had just popped into the nearby R-Kioski to buy several hefty-looking bottles of Karhu—hair of the dog, or bear, in this case. Karhu is Finnish for bear. Bear beer. Anyway, as he approached, I thought to myself again, What Would Jussi Do? But then I realized that this time I had an advantage over Jussi, who would naturally address the drunk in Finnish, whereas I could speak to him in English, making it apparent right off that I would not be a very compatible breakfast companion. I had another thought—full disclosure time—and that was that this fellow might provide me with some good material for my blog. It’s come to that. Yes, I know it’s sick. So, here he comes, lurching in my direction, with his entirely predictable question about the buses heading up Kemintie (the road to the city of Kemi). “I’m sorry, I haven’t seen any Kemintie buses, and I don’t speak Finnish,” I croaked. It was the first time I had said anything all day, which reminded me of my laryngitis. “Sorry,” I said. “I’m waiting for the 4 or the 6. On weekdays I can also take the 5 or the 7, but the 5 doesn’t run at all on the weekends, and the 7 doesn’t run this early on Saturday.” Confuse ‘em with facts, I always say. A holy day? I hadn’t heard about that. “What do you mean, a holy day?” He meant holiday, of course. “I do not know. Someone said something about holy day at party. They said there would not be many buses, and that I might have to walk home.” And that’s when I noticed that he was wearing a thin jacket and no gloves. I also noticed that he had a wry smile and may not have been quite as drunk as I had supposed. Then again, he also had an alarming amount of snot in his moustache and food in his beard. “Kussamo! Now there would be adventure for you. You made big mistake letting that bus go by. It might be the last one to come along here for awhile.” I could tell he was starting to settle in, while I wondered exactly what kind of adventures might be had in Kuusamo. It's over by the Russian border. “What do you do?” I asked, imagining that he was on the custodial staff. “Bingo. That’s the magic word, vacation. So, you’re on vacation right now?” I couldn’t help wondering whether he worked in the pneumonia ward. “What do you expect them to do?” I asked in my frog voice, “post an announcement that ‘This sign has been rendered useless by incompetent technical support staff’”? He let out a roar that must have awakened everyone in the kerrostalo at our backs. “You mean, software engineers who programmed these signs forgot to make it possible to re-set internal clocks.” Again, he laughed loudly and long. Little tears formed around the corners of his eyes, and he wiped them with red fingers. Though severely in his cups, this fellow was actually pretty good company for 45 minutes or so. We talked about travel. He asked about the United States, and he refrained from asking the question I have heard so often over here, which boils down to "How could a nice boy like you be from the Land of Bush and Cheney?" I was very grateful for that. He said impressive things about his work as a nurse, things that seemed entirely incongruous with the figure of the sorry drunk standing before me. At one point, I was tempted to ask him about my laryngitis, but then I had this vision of myself on a gurney trying to explain to an emergency room physician why I had asked a drunk at a bus stop what I should take for my sore throat. I finally gave up on the buses and told my comrade that I was going back to bed. It was not as hard to extricate myself as I had feared it might be. I was glad when he announced that he would be shoving off as well, and even gladder when I noticed that he set off in the direction of Kemintie. As I mounted my rickety bike, I heard him roar from afar, Hyvää Matkaa! I tried to reply, but between the laryngitis and my laughter, nothing came out. I went back to my flat, crashed for about three hours, woke up, prepared some piping hot soup (Knorr carrot and coriander), which I consumed, along with a rye cracker and cheese, for lounas. And then I dressed and set out on the day’s errands, the most important of which was to stock up on groceries and prepared food. My refrigerator was almost completely empty, except for three nakki (mellow little wieners). By now it was nearly noon, and it had turned sunny and beautiful, though it was almost as cold as before (minus 9). This time I left the bike in its rack, so I would have both hands free to carry home my groceries, and along the way I sucked on a pellet of concentrated menthol called Lofthouse’s Fisherman’s Friend. As I headed confidently over the footbridge toward the city center, I saw two lunatics, a man and a woman, crawling out of the river, which has now iced over except for a few spots frequented by either mallards or ice swimmers. I made my way to Stockmann, only to find that they were closed for the stealth “holy day” that was foiling my plans at every turn. The worst was yet to come. Next door, Alko—closed until Monday. On my forlorn trek home, I stopped at R-Kioski to buy two bottles of Karhu to go with my nakki. As I crossed back over the footbridge, I saw yet another person in a swimsuit scampering toward the clubhouse. It made me think how eagerly I was awaiting my regular Saturday afternoon sauna, which I was by now counting on as a sure cure. The desperate always grasp at straws. However unlikely it might be, I hope that somehow my Finnish bus-stop companion will find his way to this blog, because I would like to buy him a cup of strong, black coffee, which I should have done on Saturday morning, when he really needed it. And in a few days, perhaps, I will be able to wish him a full-throated Hyvää Matkaa!